In 2014, two experimental viruses—a genetically engineered flu strain designed by Dr. Alexander Kellis, intended to act as a cure for the common cold, and a cancer-killing strain of Marburg, known as “Marburg Amberlee”—escaped the lab and combined to form a single airborne pathogen that swept around the world in a matter of days. It cured cancer. It stopped a thousand cold and flu viruses in their tracks. Millions died in the chaos that followed. The summer of 2014 was dubbed “The Rising,” and only the lessons learned from a thousand zombie movies allowed mankind to survive. Even then, the world was changed forever. The mainstream media fell, Internet news acquired an undeniable new legitimacy, and the CDC rose to a new level of power. Twenty years later, when Senator Peter Ryman of Wisconsin decides to take a team of bloggers along on his run for the White House, Georgia and Shaun Mason are quick to submit their application. They, along with their friend Georgette “Buffy” M. are selected, and view this as the chance to launch their careers to a whole new level… that is, if they can survive the campaign trail. There’s a cool site with tons of info about the book with even campaign posters for the fictional elections. Really curious to see how this story is; mainstream media covering up the news stories with bloggers being the only ones willing to reveal information. And then get killed for it? At least that’s what I make up out of the snippets on the site. Definitely going on my To-Read list! 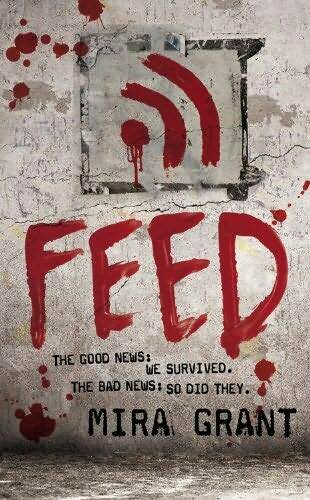 Feed is coming out in the UK on 3rd of June and is the first part of the Newsflesh trilogy by Mira Grant (Feed, Deadline, Blackout).